Welcome to my Declutter Your Wardrobe and Home online course page! I’m delighted that you are interested in learning to let go of overwhelm so you can create freedom and joy in your living space and life! I created Declutter Your Wardrobe and Home as an online course for those of you who want to create massive positive change in your living environment easily and who may not be in a position to attend events or work with me in person, invest large sums of money or would prefer to take on the task yourself in private or over a period of time, BUT you would like to avail of the support, teachings and techniques that I use with my one-to-one decluttering clients. Here I am going to give you an overview of the course I have developed. Are you feeling overwhelmed, stressed, weighed down or held back by clutter or disorganisation in your home or wardrobe? Are you finding it hard to let go of unwanted items? Are you wasting time, energy or money when you go shopping? Have you fallen out of love with or are not making the most of your personal style or your home? Have you objects or items around you that make you feel guilty, regretful or sad? If you answer Yes to any of these questions on any level, please keep reading! I have never met anyone who didn’t need some help getting their home or wardrobe in order (myself included), and I know I can help you! you are not even sure what you need then Declutter Your Wardrobe and Home is the answer. So, what exactly is Declutter Your Wardrobe and Home? 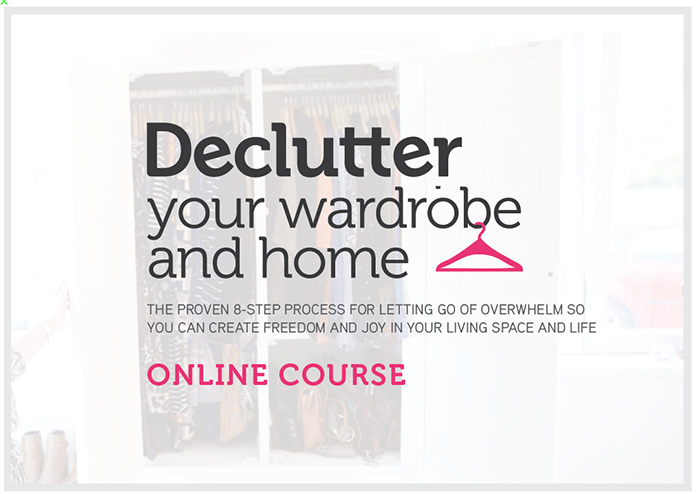 Declutter Your Wardrobe and Home is an online course that incorporates all of the key elements of the cutting-edge, best-practice approach that I have developed over many years to help my clients make positive change in their living spaces and lives. It is an all-encompassing course in which I also teach you how to use tools and techniques for decluttering and letting go on yourself so that you can put the heart back into your home and your wardrobe in a practical, effortless and creative way. You watch the course tutorials and videos, listen to the recordings and complete the worksheet exercises in your own time and at your own pace. You undertake the decluttering process in the privacy of your home in your own time, referencing the course material as required. As you have the information for life, you can re-access any of the information again and again as your lifestyle, personal tastes, and other requirements inevitably change. The Declutter Your Wardrobe and Home online course is a comprehensive body of work that teaches you, step-by-step, the information, tools and techniques that you will need to create the wardrobe and home you love and deserve. You will have access to each of these Declutter Your Wardrobe and Home tutorials, videos, recordings and worksheets for life, and this includes any future updates I make to the course. The principles work with your evolving style, lifestyle and other requirements and are always relevant. You get access to the course immediately when you process your payment. Scroll down to read testimonials from people who have completed the Declutter Your Wardrobe and Home course. Thank you Breda for your wonderful course, you are a true inspiration – keep leading the way! This training was such fun, so interesting and has improved my home, closet and life beyond measure! 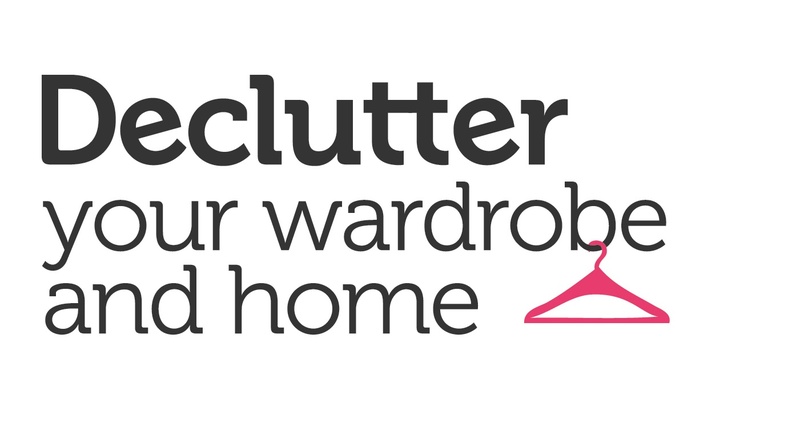 Declutter Your Wardrobe and Home has been the tonic! I’ve enjoyed dipping in and out of the course when the mood takes me and I have learned so much. I was blown away by how much I got from Breda’s Declutter Your Wardrobe and Home online course. I am generally good to organise and keep things tidy but I see now how that I wasn’t actually “decluttering”! There was sentiment attached to many items and to be honest I was feeling very overwhelmed and disappointed about my lack of progress. I was wasting time moving the same few things around the house and convincing myself I was decluttering! I understand now that I was avoiding letting go and my thinking was so limiting and even detrimental to me. Also I have always been influenced by others in my decluttering and shopping and even the way I decorate my house and felt I had no style of my own and the course really inspired me to try out new things and gain confidence in my own personal taste. In the course Breda takes decluttering to an entirely new level where it leaves no stone unturned and it affects every part of your life in a positive way. I had read a bit about decluttering and organising over the years and picked up some helpful tips but Breda’s wise and sympathetic philosophy was almost entirely new to me and such a revelation. I am so thrilled to have come across this beautiful course because it has given me back control and helped me to create the lovely and personal home I’ve always wanted and never imagined I’d have. Nobody understands decluttering quite like Breda, she is The Guru! I’d nearly given up trying to declutter because I’d tried pretty much everything out there and I was exhausted from feeling a failure but I have to say the exercises and techniques in this course were totally unexpected and they REALLY work – Breda has something special here, highly recommended. I honestly don’t think most people (myself included before I did this course!) understand what you need to look at before you can De-clutter. The physical is just not enough because everything in our lives is connected. Saying that, I’m amazed at how parts of my life that I would have never expected to change beyond the physical are so much better now that I have learned the tools and skills in this groundbreaking course. This course is kind of genius. I’ve wasted years trying to achieve the happy feelings and the physical results of a decluttered living environment with a very poor outcome but thanks to Declutter Your Wardrobe and Home I have finally nailed it and I’m so excited for the future of my closet and my home! I recently did Breda’s Declutter Your Wardrobe and Home online course. Before I did the course I would have run a mile from something like this. The main reason is that I would have been ashamed that I might have had some clutter in my home and I would have been very uncomfortable with someone coming in and looking at the things that were causing me restriction or guilt or the things that would have been stopping me from moving forward in my life. I know that often people don’t think that clutter in our homes might have that effect but I realised that after doing the course that it absolutely does. I was able to declutter myself in the privacy of my own home without having to expose myself to anyone in any way. After I decluttered my house the impact on my business was phenomenal, my environment was clean, my head was clean, I felt peaceful and free, which had an incredible impact in my business because I was literally working from a space of complete focus and clarity. This course is amazing and massively supportive on all levels, I always felt that I wasn’t alone and that all the answers I needed were in the course. Fantastic value for money. Brilliant, brilliant course. This is the decluttering method that will change your life. The investment for Declutter Your Wardrobe and Home online course is a single, one-off payment of €347. The course includes lifetime access to tutorials, videos, voice recordings, PDF worksheets and MP3 recordings. In my opinion, we get the most from decluttering and our lives transform in the best way possible when we learn this life-skill for ourselves. My approach to decluttering and organising is down-to-earth, gentle and encouraging. As clutter takes time to build, decluttering is a a process that needs to be honoured. This course is based on a tried-and-tested method that focuses on developing the right habits over time so that you can make life-long change. You are empowered, step-by-step, and you are in control all of the way. I’ve tried to declutter in the past but wasn’t successful with it. How will this course work for me? The reasons for clutter and disorganisation are often complex and deep-rooted, and, although the practical elements like organisation, storage and personal style are important in the process, we can’t change unless we get to the root of what’s holding us back and overcome these blocks. I’ve worked with people from all ages, situations and walks of life who have had great results from the techniques and information in this course so I really believe it will help anyone. Although I am very organised I find it hard to let go. What will I get from the course? I have come across many clients who are excellent organisers but find it difficult to let go, and this is how I used to be myself! Organising and decluttering are two very different skill-sets, and this course looks at both the creation of organisational systems and the letting go so you can begin to create the wardrobe and home that brings you joy. Will I feel guilty when I shop in future? My philosophy is all about creating a healthy and balanced relationship with your physical environment, so there is no room for guilt! Shopping for clothes and other items should always be an enjoyable experience, and the course teaches you to shop selectively so you can save money, time and energy, and even have fun with it! Will working online rather than in-person be as effective? From my experience some clients who have accessed some of my material where they have not worked in-person with me have had incredible results. As all the necessary information will be provided, the key to getting results is to take responsibility to implement the steps. How long will it take me to do the course? You can do the course at the pace that feels most comfortable to you and that works best for your lifestyle, time and energy. The principles of the course will always be relevant and as you have life-long access to the material you can revisit the tutorials, videos, recordings, worksheets and MP3’s any time you need. 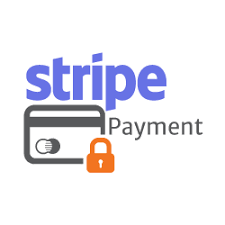 Click the Buy Now button below and you will be taken to a page where you can securely process your payment via Stripe and then register for the course. Once you have registered you will immediately receive an email with all the information and instructions you need to get going straight away. We will post the Declutter Therapy™ ultimate wardrobe decluttering experience Hardback Book-and-DVD Set within two working days of receiving your order.